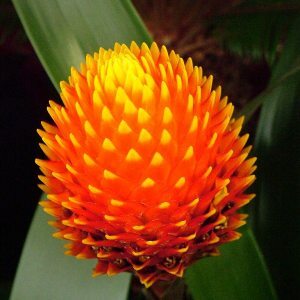 With its cone-shaped spike of orange-red flowers, Guzmania conifera is a vibrant addition to the Bromeliad ‘tree’, which demonstrates the epiphytic nature of many members of this tropical family. As an epiphyte the plant naturally uses tree branches as support, but without being parasitic. It collects water in a central cup formed by its rosette of leaves, as well as debris such as leaf litter and insects, from which it is able to obtain nutrients. G. conifera naturally inhabits rainforests in Peru and Equador, and enjoys the hot and humid atmosphere of the Tropical House. Although this plant will die after it has flowered, it will produce new plantlets called ‘pups’ at its base, which can be removed from the ‘mother’ to grow into a new generation of exotic plants.